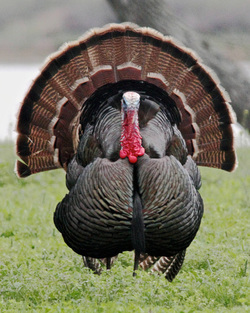 Trustees of the Michigan Wildlife Habitat Foundation recently voted to spend up to $59,000, along with $5,000 committed by the Michigan Wild Turkey Federation, to import 200 wild turkeys into southern Michigan. The birds, which will be trapped by a professional wildlife consultant in Vermont, will be released at sites selected by Michigan's Department of Natural Resources (DNR). The wild turkey restoration will be the foundation's major project for 1985. Each year following its inception in 1982, the foundation has picked a restoration task of major ecological impact that demands considerable resources of the foundation. The Milli-Ander Wetland Restoration Project was undertaken in 1983, and the Bengel Wetland Restoration Project was initiated in 1984. When settlers immigrated to Michigan, wild turkeys ranged throughout the deciduous forests of the southern part of the state. By theturn of the century, they had disappeared. In 1954, the DNR brought game-farm turkeys from Pennsylvania and released them in Allegan County. The Allegan, and subsequent releases, were the nucleus of the 15,000 turkeys that inhabit northern Michigan today. These northern birds, whether because of their domestic blood or their developed reliance on man to feed them in winter, are less successful when released than purely wild birds are. So, in 1983, the DNR began importing wild birds from Iowa, Pennsylvania and Missouri to release in southern Michigan. To date, 199 birds have been released at eight sites: Waterloo Recreation Area (Washtenaw County); Rose Lake Wildlife Research Area (Clinton County); Seven Lakes State Park (Oakland County); and Flat River (Montcalm County), Three Rivers (St. Joseph County), Lapeer (Lapeer County) and Barry (Barry County) state game areas. 1985 pre-nested estimates put southern Michigan's turkey population at a conservative 362 birds. John Urbain, DNR forest game bird specialist, believes this spring's ideal weather for ground-nesting birds could cause turkey numbers to increase to close to 600 going into this winter. Urbain says the foundation's help, however, will considerably speed the repopulation of southern Michigan with wild turkeys. "We have had a half dozen priority sites for turkey releases, but we're waiting for the original eight flocks to increase to the point where we could trap and transfer some of their birds," Urbain says. "The Waterloo and Rose Lake flocks are large enough that we could pull a few birds from them this winter." "Getting these wild adult birds through the foundation will mean that we can have 20-bird flocks at the Port Huron (St. Clair County) and Maple River (Gratiot County) state game areas and the Fort Custer (Calhoun County) Recreation Area yet this winter, and maybe additional flocks in Hillsdale, Eaton, Branch, and Gratiot counties," he added. Birds are trapped with nets during the winter, when they are flocked and most susceptible to bait. Vermont has promised some of their wild birds, originating from Pennsylvania and New York stock, this winter. The foundation will pay to have the birds captured and shipped to Michigan. To ensure the project's success, approximately $20,000 of the approved money will finance a public relations campaign. The campaign will stress the benefits to all citizens of restoring a native bird, encourage them to confine their pets, discourage release of game-farm stock, and emphasize that people should not let their domestic turkeys run free so the progeny of the wild birds can be kept genetically pure. Finally, to protect the project, $4,000 in reward payments has been designated for identifying poachers. Though most of the foundation's work is involved in restoring habitat to benefit wildlife, the foundation is also interested in restoring native wildlife populations to their ecological niches. The foundation, for example, assisted in last winter's importing of moose into Michigan's Upper Peninsula.